A simple fabric-covered traditional screen is an attractive and versatile addition to your home. In fact, my screen has quickly become so indispensable I now wonder how I managed without one. Sitting in front of a fire on a cold winter’s night, I strategically place my traditional screen to stop the draughts that sneak up from behind and always seem to abound in a period house. A traditional screen becomes a useful portable partition in a big room that has several functions. If you have a spare room also used for storage, a screen really comes into its own by hiding clutter from view. Country auctions are good places to find a screen. Dealers may well snap up the bargains but are not usually interested in buying items that require too much work to restore them to a saleable condition. So you may well find a tatty looking traditional screen in need of an extreme makeover. Choosing the new fabric is the fun part and you’ll be spoilt for choice. To make the screen even more adaptable why not cover each side with a different but toning material? I’ve illustrated the idea here with a check design from Colefax and Fowler (020 7244 7427; colefax.com) and a floral by Jane Churchill (020 7244 7427; janechurchill.com). When measuring up for the amount of material required, remember to allow extra for pattern matching. Finish off the panels with a flourish; you could choose a border of nail trim for an understated look, or a decorative braid or trimming for something more exotic. Buy these extras from a local upholstery supplier or try mail order emporium, JA Milton Upholstery Supplies (01691 624023; jamiltonupholstery.co.uk). 1. Remove old fabric covering: Strip off the old fabric covering: prise out the tacks and staples with pliers, pincers, a tack lifter or a ripping chisel. Eye protection is recommended when doing this. Once all the tacks and staples are pulled out, smooth any rough edges with glasspaper, preferably working with the grain. 2. Replace the rusty hinges: The existing hinges on the screen are rusty and bent so need to be replaced. Rusty screws can be difficult to remove so always try to match your screwdriver to the screwhead. Too small a screwdriver may ‘wring’ the slot in the screwhead and one that is too large may damage the surrounding wood. 3. Renovate wooden joints: Judging by the number of holes in the wooden frame the screen has been re-covered many times in its lifetime. Some of the joints have worked loose. Brush away dust and fluff with a paintbrush. Squeeze some wood glue into the open joint (a syringe is useful here) and reinforce with metal corner brackets. 4. Line panels with calico: To give the screen more solidity the panels are initially lined with calico. Measure and cut the calico to size allowing for a turning all round. Staple it to one end of the frame. Pull the calico taut and secure it at the other end. Staple it along one side, then pull it taut before securing to the opposite side. 5. 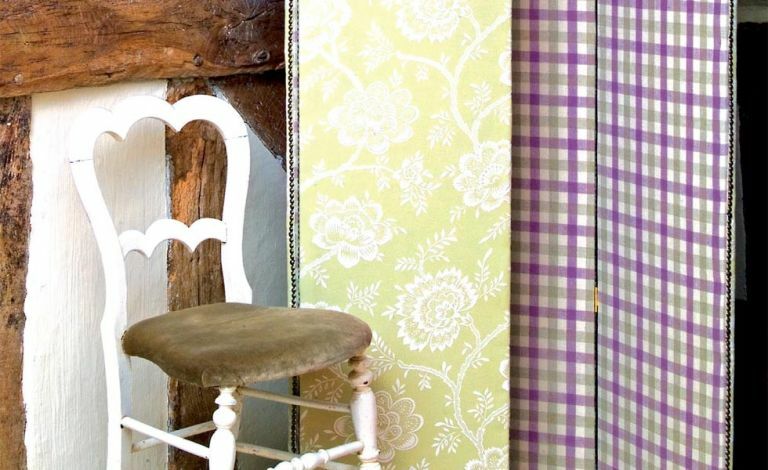 Measure fabric for top covering: Cut out the size of top fabric required (we used Colefax and Fowler ‘Tilbury Check’ in Lilac/Green), allowing a turning all round and matching the pattern. Fix to one end of the frame with staples or upholstery tacks. Pull it taut and secure it to the other end. Staple or tack it along one side. Then secure it to the opposite side. 6. Fasten new hinges: Fix new brass hinges. As the screen needs to fold up flat or stand up in a zigzag fashion you need to buy special folding screen hinges. Make pilot holes with a bradawl first, then drive in the screws. Alternatively lightweight screens can be joined together with strips of heavy cotton herringbone tape. 7. Attach second fabric covering: Measure and cut the second top fabric (we used Jane Churchill ‘Ashbrook’ in Olive), taking into account a turning allowance and the need to match the pattern. Fix it to the frame with tacks ensuring that the fabric is taut. Longer tacks will be needed at this stage as they will have to go through several thicknesses of fabric. 8. Add a decorative trimming: We finished the panels with a border of nail trim. Secure it using matching Old Gold Speckled fixing nails. To avoid marking the nails you can use a purpose-made nylon-tipped hammer. Rather than buy a tool for a one-off job we stuck a self-adhesive felt chair leg protector on to the hammer face to protect the nail heads.